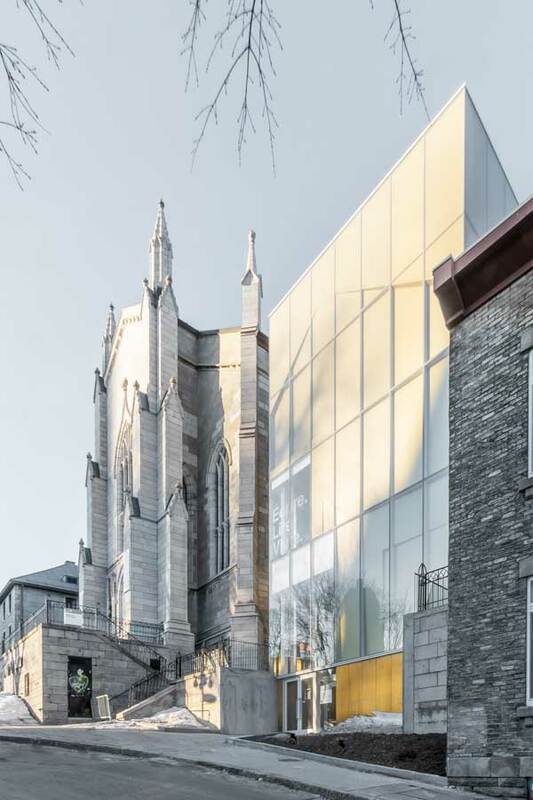 House of Literature, designed by Chevalier Morales, integrates into the historic urban context in Old Québec. The House of Literature is situated in the former Wesley Temple, in the heart of Old Québec. It underwent an interior transformation and a modern, luminous extension was added. The building is located in a historic site that is part of the United Nations Educational, Scientific and Cultural Organization’s (UNESCO’s) World Heritage List. It also houses a public library and a permanent exhibition on Québec literature, writing carrels, a comic book workshop, a creation studio, a writer’s residence, a quiet lounge, and a variety of events. Partly transparent, the new annex offers an open and contemporary face. The outer glass envelope is superimposed on a set of folded and embossed metal panels. Additionally, the simple-line appendix blends into the historic urban context of its setting. Circular in shape and multi-level, the new auditorium closes on itself through concentric sliding acoustic panels integrated into the ceiling rails. Above, brightness in the library is accentuated by the whiteness of the place. Accessed by a sculptural spiral staircase, it recovers the spatiality of the original church. Many of the original details, such as the pointed windows and bas-relief details of the ceiling have been preserved. The architects designed and integrated the museum scenography on the three floors of the House of Literature, moving from the new building to the temple. The insertion approach for the new House of Literature was mainly to enhance, complement, and preserve the heritage value of the existing building, both interior and exterior.